"Our main aim is to see the turbine out at sea and producing energy", says Olav Weider, Managing Director at the Norwegian company Dr.techn.Olav Olsen AS. "Clean energy for the world. We believe that offshore wind has an important part to play in the green transition, and this is a milestone on the road towards that aim", he says. "We believe that offshore wind has a big future", says Leif Delp, a Project Director at Statoil. "We are now on the start line in terms of concept development", he says. "Clearly we need to optimise our concepts and achieve better profitability, and this process is now under way. As more players enter the scene, perhaps coming up with new and exciting projects, we will definitely see dramatic reductions in the costs associated with power generation from floating wind turbines", says Delp. Representatives of the industry and researchers met recently at SINTEF Ocean's SeaLab facility where the final model tests of Dr.techn.Olav Olsens innovation were being carried out. The model was tested under normal current, wave and wind conditions, and was also subjected to extreme weather testing. The unique aspect of the company's concept is that the turbine is of concrete construction. It is thus anticipated to have a long life with little need for extensive maintenance. "We believe that the mass production of floating wind turbines will be easier than for fixed structures because the latter have to be specially tailored to the seabed conditions and water depths at the locations where they are installed", says Weider. "Floating turbines can be much more adaptable in terms of their location", he says. Researchers at SINTEF are receiving an increasing number of requests from wind energy generating companies regarding the further development and testing of technologies for application in offshore energy production. 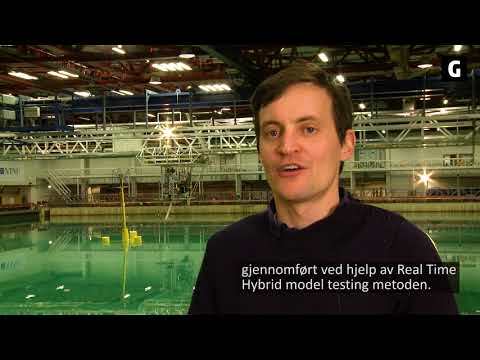 The EU project LIFES50+ has enabled SINTEF's team to develop a unique test method called "Real-Time Hybrid Model (ReaTHM®)". "The wind turbine is exposed to physical waves and currents, and simulated wind loads – all in real time", says Maxime Thys, a researcher at SINTEF Ocean. "The method provides considerable flexibility and reduces costs", he says. "Costs are lower because we don't have to design and build a rotor for the model. Flexibility is achieved because we can supply wind from various directions and can also simulate extreme conditions which it may be dangerous to implement using a physical model with a rotor", he says. "Statoil has prepared the ground with its own Hywind turbines", says Weider. "A lot is happening in France, Japan and other places around the world. Offshore wind generation has been talked about for a long time, and is now becoming a significant market", he says. SINTEF has been heavily involved in both the pre-design and design phases of the Dudgeon wind farm in waters to the east of the UK. As an R&D partner in NOWITECH (Norwegian Research Centre for Offshore Wind Technology), SINTEF Ocean have been actively involved in developing robust numerical tools for the design and modelling of bottom-fixed offshore wind turbines. Controls for grid connection of offshore wind via multi-terminal HVDC grid, algorithms and models.